A refreshing way to diversify your fashion jewellery collection! 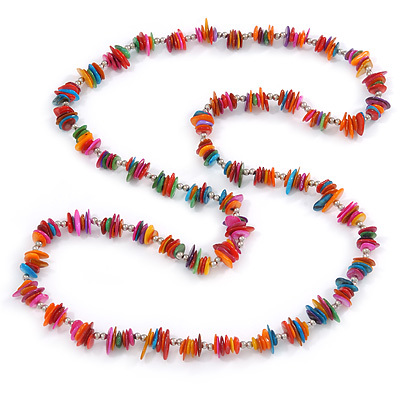 This beautiful long necklace features an alternate pattern of evenly spaced multicoloured sea shell nuggets and tiny silver tone metal beads. The necklace approx. 98cm long and an easy-to-wear, no fastening so can be slipped over the head. Irregularities are normal characteristics of the materials and handmade nature of this unique product.